Kent Dunn reports that he has been given clearance by his Earth Defense Force (EDF) to disclose to the public that operations are now taking place against the dark cabal (Khazarian Mafia) located at the Denver International Airport (DIA). People are urged to be careful entering this area during these military operations designed to remove the cabal from their deep underground military bases (DUMBS). Kent Dunn reports that many white hat military foreign troops are involved with this operation against the dark cabal. Joint operational strike force include American, Russian, Chinese, and Chechens military forces. This DUMB at the DIA is considered the last remaining strong hold for the Khazarian Mafia/New World Order/Dark Cabal. The head of the Israeli Mossad of the United States is said to be held up inside the underground bunker of the DIA. This current operation to clear out the DUMB under the DIA is said to take a couple of days due to the massive size of the underground base at the Denver International Airport. For people not familiar with the Denver International Airport (DIA) and its ties to the Khazarian Mafia/New World Order/Dark Cabal, you should take a look at this report by the Vigilant Citizen Blog. The DIA is considered to be one of the most sinister places on earth due to its dark occult and masonic connections, architecture, statues, and art murals. 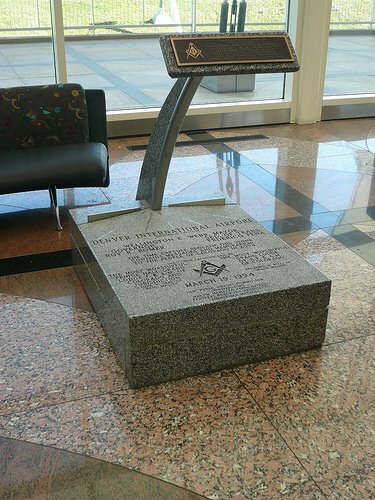 You can even view a public display at the DIA of the masonic order capstone with inscriptions that dedicate this airport to the "New World Airport Commission". See the pictures below. The capstone is inscribed with the date of dedication: March 19, 1994. If you add up all of the numbers in the dedication date, March 1+9+1+9+ 9 +4 you get to the number 33. In Freemasonry, the number 33 represents perfection and the highest degree in Masonry you can hold. Even though there is a lot of occult imagery throughout the DIA, the most sinister and secret observation is the hidden labyrinth and deep underground complex built under the airport that extends for miles and connects with other underground military bases for cabal operations. Intellihub News Network got an exclusive interview with a Whistle-Blower that exposed the DUMB located at the DIA. The report by Intellihub was conducted back in 2014 and can be viewed at this link, entitled "Exclusive: Secret underground base beneath Denver International Airport now revealed by whistleblower".